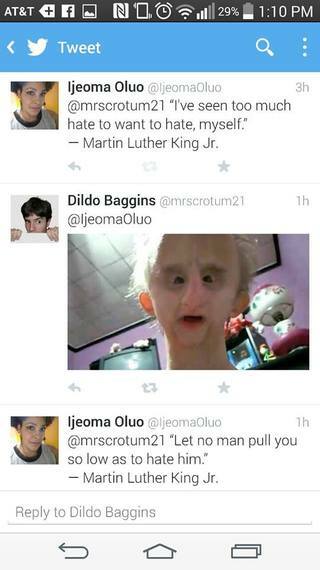 On Martin Luther Jr. King Day, Ijeoma Oluo was harassed by an exceptionally aggressive, racist troll on Twitter. But rather than flipping out on him, Ms. Oluo started responding with quotes from Dr. King himself. 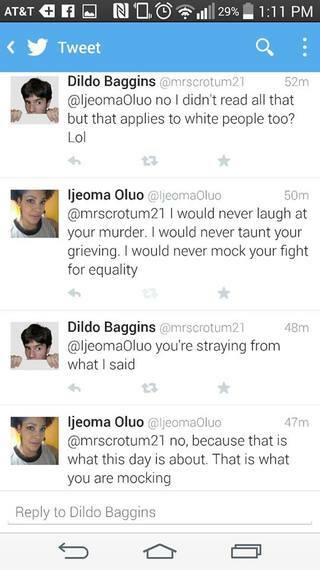 While the racist troll continued on with his terrible vitriol, Ijeoma never allowed herself to lash out. 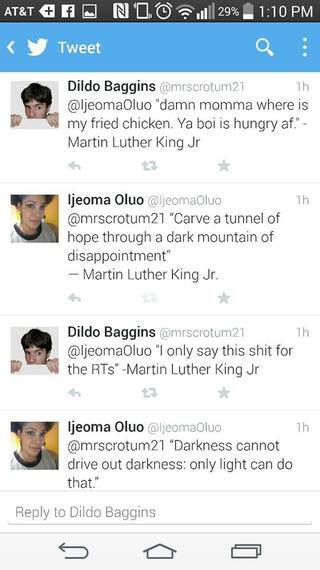 But when Ijeoma stopped responding with quotes from Dr. King, and instead empathized with the troll, a bit of light started shining through. 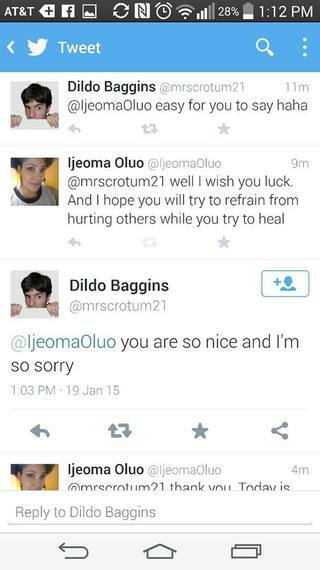 The troll was clearly looking for someone to lash out at him, and was taken aback when he was met with kindness. 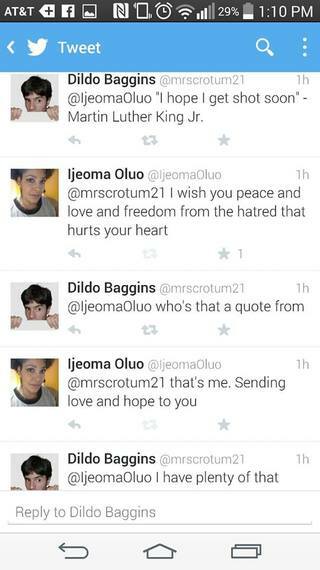 During the rest of the dialogue, the troll's bigoted persona begins to fall apart, and Ijeoma fills the space with grace and compassion. 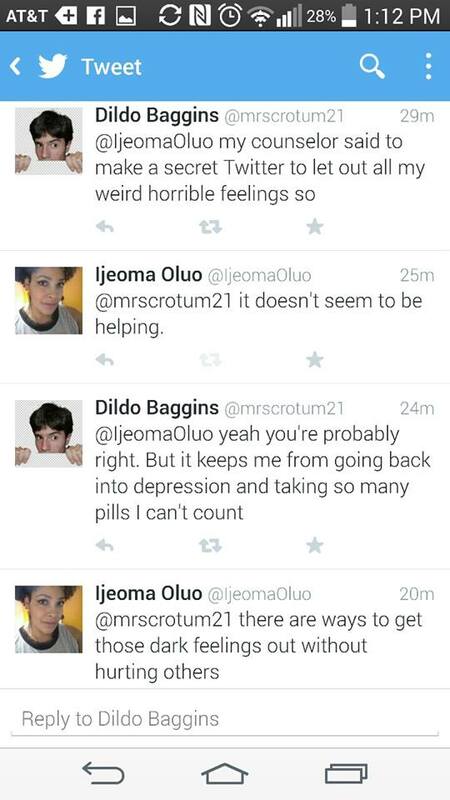 It comes out that the troll is, allegedly, actually a 14-year-old kid who's recently lost his mother, and whose therapist has told him to vent his anger on Twitter. We can only hope that by engaging in this way, rather than impugning the troll's bigotry, Ijeoma has had an impact on this person. Ms. Oluo is a prolific tweeter whose writings on social justice and the politics of race have graced the pages of New York Magazine, Medium, and Jezebel among others. 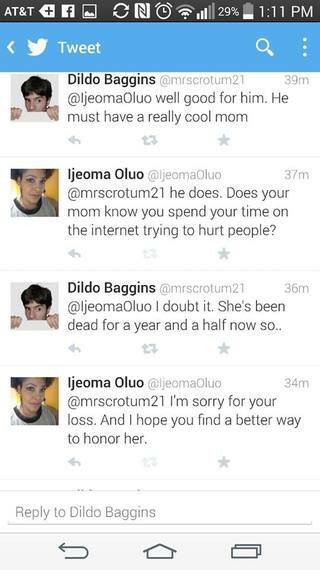 When I called Ijeoma to discuss how she was able to handle this online harassment so well, I was surprised to hear that the more vicious trolling doesn't get her worked up. 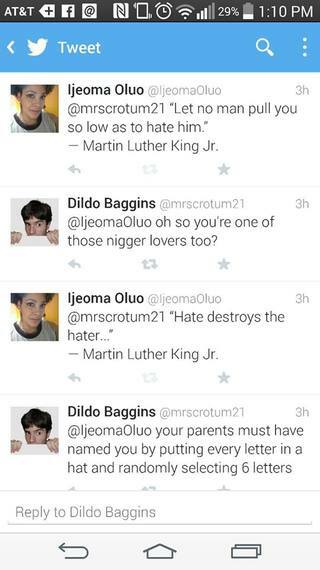 "The overt racism rarely bothers me. The racism that people are unaware of is what bothers me." 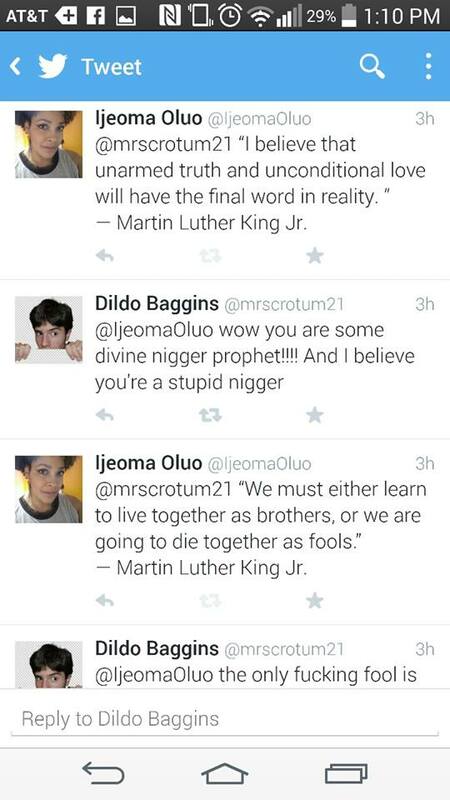 When people are unwilling to recognize their own racism, it often comes out in what she calls coded language. "When people talk about black on black crime, what they don't realize is that they are supporting a very racist view of black people, of black society," she said. "They don't even recognize the bias in that language, and that's much more harmful in my opinion than the guy you can spot across the street yelling racial slurs at people." 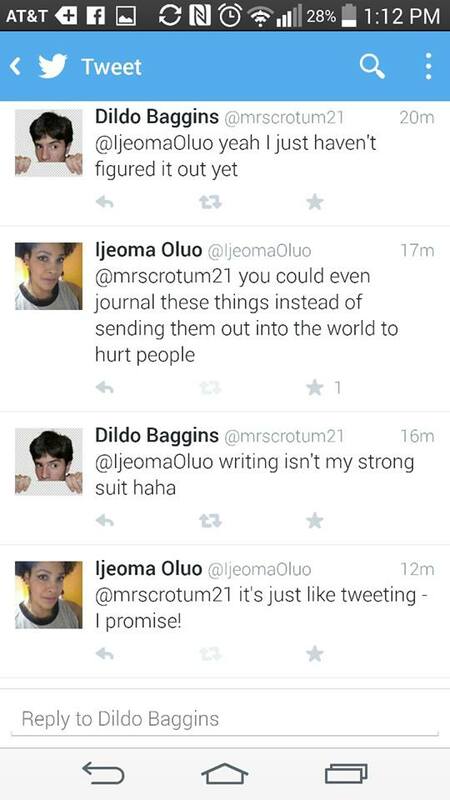 Getting into discussions with people who don't see their own prejudice can be tricky. For instance, Ijeoma says that someone who claims they don't see colour may as well be saying that they only see white people. "So when you don't see peoples' differences you assume they are like you, and that's a direct denial of what people of colour go through, and also great wonderful things about them," she said. Assuming everyone is just like you also works to short-circuit empathy with people who have had different experiences. 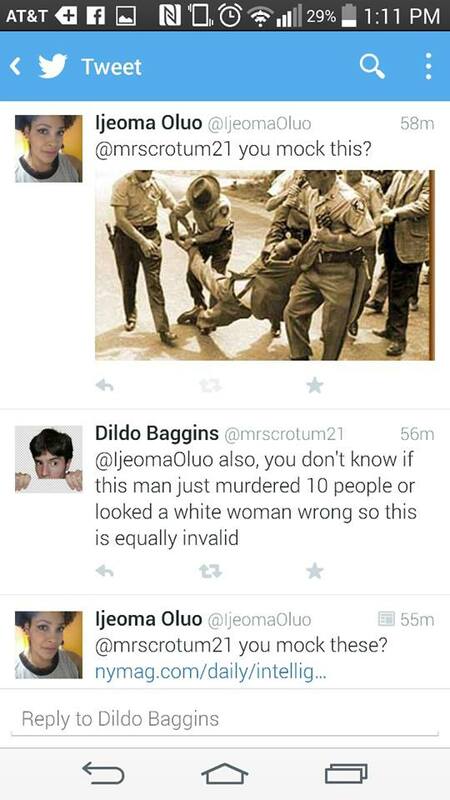 If you've never been harassed by the police, for example, it can be easy to justify the very real police brutality suffered by minorities across North America. For this reason, Ijeoma doesn't ask people to imagine what it's like to be a minority when she's confronting racism. Rather, she appeals to peoples' humanity. For instance, during her frequent discussions of cultural appropriation: "What I always end up saying is if a group of people say 'This hurts me' and you continue to do it, then what you're saying is 'My ability to wear this headdress or wear this costume or speak in this accent is more important than the feelings of all of these people.'" "If you establish the basic rules of 'Do you care about people? Do you care about people's feelings? Do you believe that just because someone's brown doesn't mean they are automatically lying?' 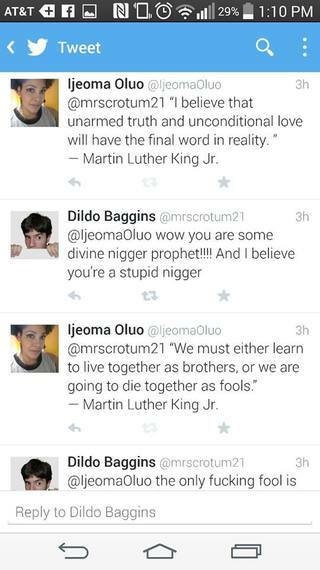 If you believe these things then when a group of brown people tells you that we have a problem with police brutality you need to listen." 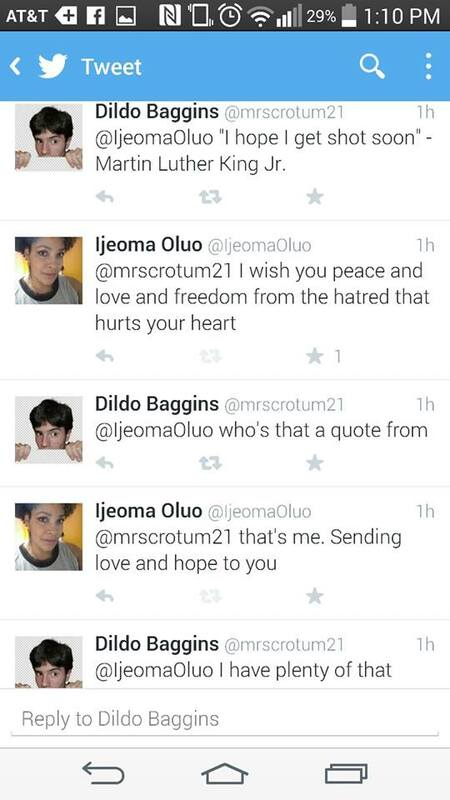 I was curious to hear what Ijeoma thought about direct targeting of racists online. 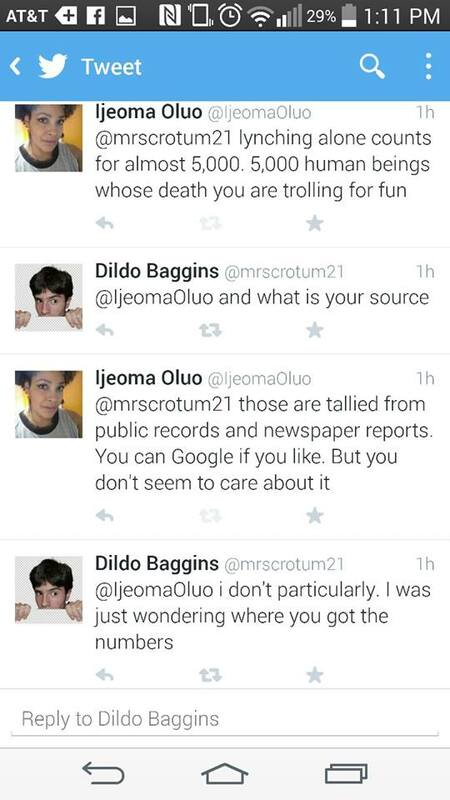 I asked her for her opinions on a site called Racists Getting Fired that digs up the contact information of people who have posted exceptionally racist statements, and asks the Internet to contact their employers to get them fired. In some cases, they've been successful. While Ijeoma admits that some people may get some "glee" from these tactics, "it's not about teaching anyone lessons, it's about cheap thrills. 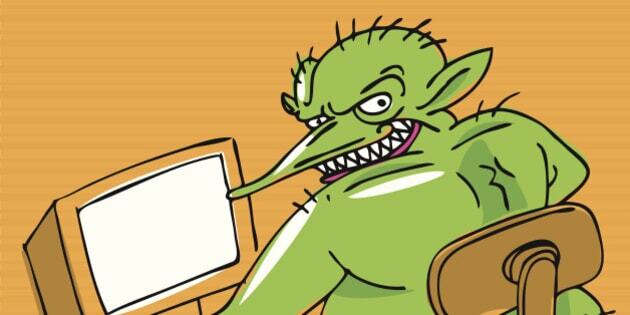 Basically, they are doxing," she said, referring to the practice of publishing personal information about people online, which can lead to real-world actions taken against them. 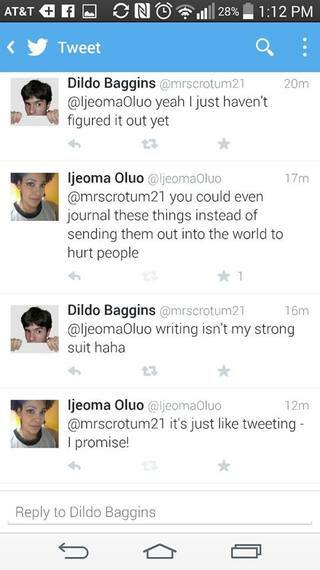 "As a social justice writer, I live under the threat of doxing everyday. 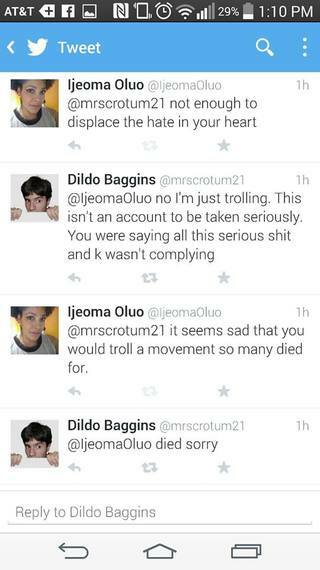 It's a dangerous violation, and I don't think it's OK to use the tool that's used by violent racists against them. 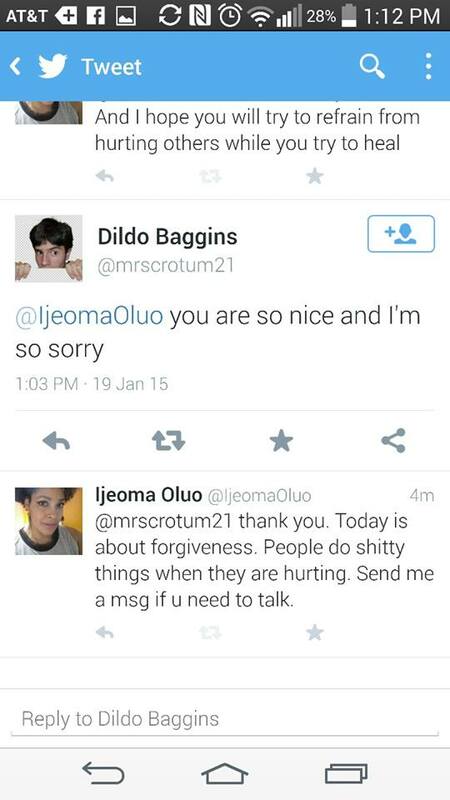 It's not furthering the dialogue," she said. Beyond the tactic not actually opening dialogue with people, the focus on the most extreme forms of racism can be self-deluding. "We focus so much on that 'bad racist' over there that we pay no attention to the truly important things that are upholding that entire racist structure," she said. 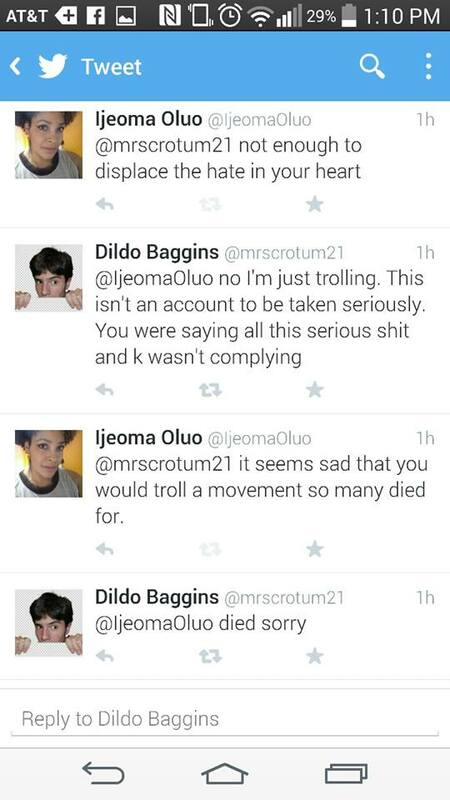 According to Ijeoma, a far more effective tactic would be to use the power of collective action to target those individuals, corporations, and practices that contribute to structural racism. 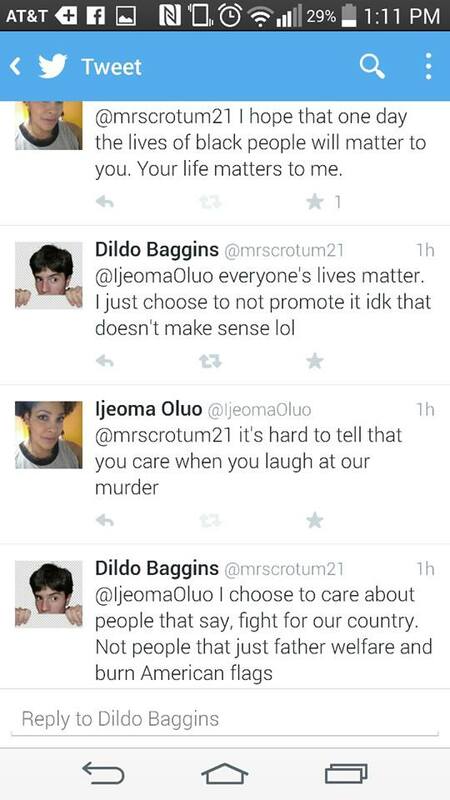 For instance, we could be targeting corporations that underpay their employees -- many of whom are people of colour. Or we could point out the questions on standardized tests that are racially biased and ensure that students of colour get lower scores. Or we could put pressure on the police to rewrite the training manuals that set up systems like stop and frisk, or the carding system in Toronto. We could publicly call out the politicians who use coded language, like 'thugs' and 'reducing the crime rate,' which are really promises to crack down on black people. 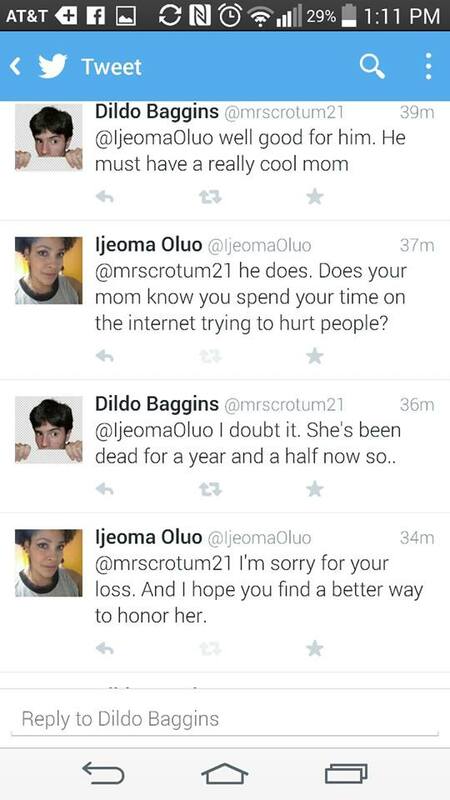 "The truth is that none of these people on Twitter or Facebook are going to be what hurts me," says Ijeoma. "That's not what I worry about when I send my son out the door -- I worry about everything else in the system that's trying to bring him down and things like Racists Getting Fired are just distractions." 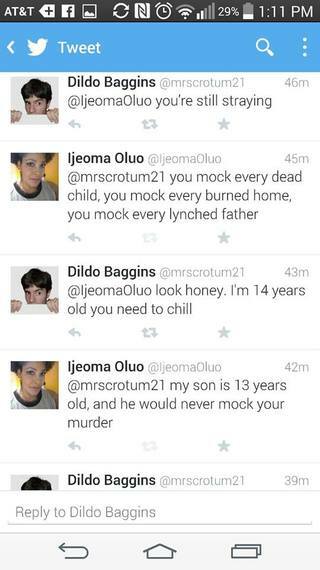 I think that we should all be taking a page from Ijeoma's playbook. When confronted with family or friends who express troubling views on race, or class, or gender, or sexual preference, we can keep our cool and bring it back to basic human dignity. 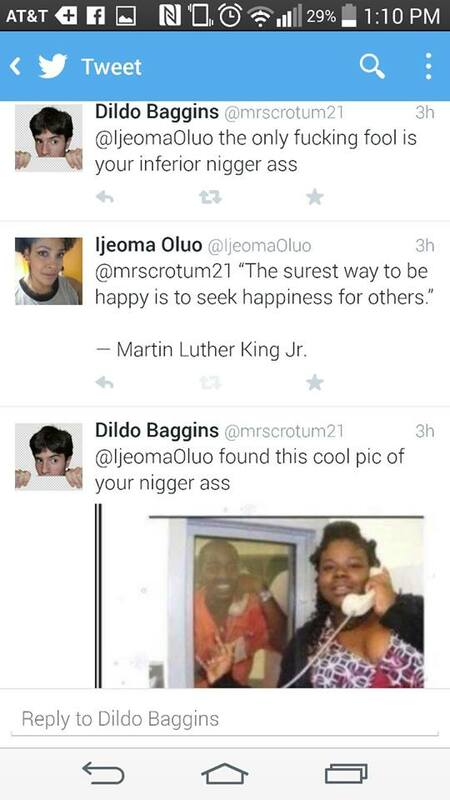 This deep humanist approach was exactly the tack she took with her Twitter troll on Martin Luther King Jr. Day -- and it had real effects on a young man who was using hateful language to mask his own suffering.